louisgray.com: Are Early Adopters Leading Move from Firefox to Chrome? Are Early Adopters Leading Move from Firefox to Chrome? With the first month of 2010 in the books, Web statistics tracker Net Applications made headlines showing Google Chrome's browser market share exceeding five percent usage, taking tenths of a percentage point away from the top two most popular browsers on the Web, Microsoft Internet Explorer and Mozilla's Firefox. 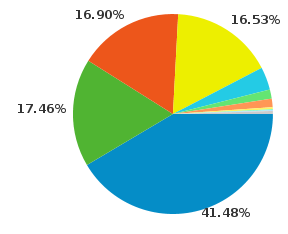 But in our little niche, Internet Explorer has never had that huge a market share in terms of visitors to my site. Most of my peers utilize Firefox or Chrome, or if they are Macheads like myself, they trend toward Safari. After crunching the numbers, looking at my Google Analytics data from the last 13 months, to get solid year over year data for the month just completed, the trend is clear: cutting edge Web users are trading in their Firefox browsers and trying Google Chrome. 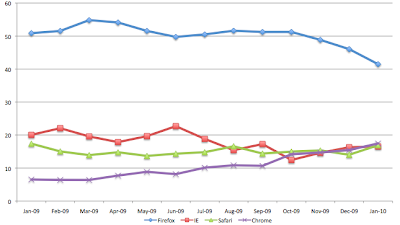 Over the last year-plus, the top four Web browsers to louisgray.com have been unchanged: Firefox, IE, Safari and Chrome. Yet in four of the last six months, Safari visitors have outpaced Explorer visits. Meanwhile, in October of 2009, Chrome visits passed up IE users, and by December, Chrome visitors had passed up Safari visitors, good enough for the second-highest browser share overall. This ranking repeated in January. Just how rapidly has Chrome taken market share in terms of visits to the blog? In January of 2009, Chrome represented 6.53% of all visitors, a mark that held mostly steady through March of 2009. In the month just concluded, Chrome represented 17.46% of all visitors, an increase of 267%, nearly tripling. At the same time, Firefox use dropped from nearly 51% of all visits to just over 41% of all visits, after peaking in March of last year with almost 55% of all visitors. The 10% of visitors who stopped using Firefox almost exclusively switched to Chrome, for IE visits declined only slightly from 20% to 16.5% of all visits, while Safari has held rather steady, at about 17% of all visits both in January 2009 and January 2010. At the risk of making mountains out from small sample sizes, the trendlines cover almost a million pageviews over 13 months, and in each of the 3-month blocks following January of 2009, you could see a steady increase in Chrome visitors, from 6% in Spring of 2009, to 8% in the Summer, 10% by Fall and more than 14% by Winter. If the trend lines hold, I would not be surprised to see Chrome eclipse 20% of visits here by summer, and see Firefox fall to 35%, with continued declines in Internet Explorer visits that keep it below 15%. Pivot tables in Google Analytics also show that most of my Internet Explorer visits are from Google searches and other non-direct visits. Most referred visits from social networks, like FriendFeed, Twitter and Facebook, prefer Firefox, Safari and Chrome.